21 Feb 2013 With 1.5B Committed to the UN, Why Typhoid is Breaking in Syria? All available evidence points to Putin’s complicity in the 1999 apartment-building bombings in Russia. Those who have tried to investigate have been killed off, one by one. I have been trying to call attention to the facts behind the bombings since 1999. I consider this a moral obligation, because ignoring the fact that a man in charge of the world’s largest nuclear arsenal came to power through an act of terror is highly dangerous in itself. Russian human-rights defenders Sergei Yushenkov, Yuri Shchekochikhin, Anna Politkovskaya, and Alexander Litvinenko also worked to shed light on the apartment bombings. But all of them were murdered between 2003 and 2006.By 2007, when I testified before the House Foreign Affairs Committee about the bombings, I was the only person publicly accusing the regime of responsibility who had not been killed. The bombings terrorized Russia. The Russian authorities blamed Chechen rebels and thereby galvanized popular support for a new war in Chechnya. President Boris Yeltsin and his entourage were thoroughly hated for their role in the pillaging of the country. Putin, the head of the FSB, had just been named Yeltsin’s prime minister and achieved overnight popularity by vowing revenge against those who had murdered innocent civilians. He assumed direction of the war and, on the strength of initial successes, was elected president easily. Almost from the start, however, there were doubts about the provenance of the bombings, which could not have been better calculated to rescue the fortunes of Yeltsin and his entourage. Suspicions deepened when a fifth bomb was discovered in the basement of a building in Ryazan, a city southeast of Moscow, and those who had placed it turned out to be not Chechen terrorists but agents of the FSB. After these agents were arrested by local police, Nikolai Patrushev, the head of the FSB, said that the bomb had been a fake and that it had been planted in Ryazan as part of a training exercise. The bomb, however, tested positive for hexogen, the explosive used in the four successful apartment bombings. An investigation of the Ryazan incident was published in the newspaper Novaya Gazeta, and the public’s misgivings grew so widespread that the FSB agreed to a televised meeting between its top officials and residents of the affected building. The FSB in this way tried to demonstrate its openness, but the meeting was a disaster: It left the overwhelming impression that the incident in Ryazan was a failed political provocation. Three days after the broadcast, Putin was elected. Attention to the Ryazan incident faded, and it began to appear that the bombings would become just the latest in the long list of Russia’s unsolved crimes. Two motions in the Duma to investigate the Ryazan incident failed in the face of monolithic opposition from the pro-Putin Unity party. In February 2002, a third motion to investigate failed and a group of Duma deputies and human-rights activists organized a “public commission” to seek answers independently. Its chairman was Sergei Kovalyev, a Duma deputy and former Soviet dissident. Sergei Yushenkov, another Duma deputy, was the vice chairman. The commission had no official standing, but the Duma deputies could pose questions to the government in their individual capacity. By 2002, the commission members were facing a rising tide of indifference. The second Chechen war was being prosecuted successfully and an economic boom was gaining momentum. Putin’s popularity rose to an all-time high. Shortly after the commission began its work, however, an incident occurred that reminded Russians of just how mysterious the apartment bombings were. In March, the newspaper Noviye Izvestiya announced the result of its investigation into the fact that Gennady Seleznev, the speaker of the Duma and a close associate of Putin, had announced the bombing in Volgodonsk on September 13 — three days before it occurred. Vladimir Zhirinovsky, the head of the Liberal Democratic party, told journalists that same day what Seleznev had said, but they could not confirm it, so it was not reported. On September 16, however, the building in Volgodonsk really was blown up, and on September 17 Zhirinovsky demanded an explanation of how Seleznev had known about the bombing in advance. “Do you see what is happening in this country?” he said, shouting and gesticulating from the podium in the Duma. “You say an apartment building was blown up on Monday and it explodes on Thursday. This can be evaluated as a provocation.” Seleznev avoided responding, and Zhirinovsky had his microphone turned off when he persisted in demanding an explanation. In March 2002, however, Noviye Izvestiya succeeded in obtaining the transcript of what Seleznev had said on September 13, 1999. His precise words were: “Here is a communication which they transmit. According to a report from Rostov-on-Don today, this past night, an apartment house was blown up in the city of Volgodonsk.” The newspaper asked him who had informed him about the bombing in Volgodonsk three days before it happened. He answered, “Believe me, not [exiled oligarch Boris] Berezovsky,” who had accused Putin of orchestrating the bombing. In this way, he indicated that he was well aware of who, in reality, had given him the information. Seleznev then told the newspaper that, on September 13, he had been referring to an explosion on September 15 that was part of a war between criminal gangs and had not claimed any victims. Seleznev’s explanation, however, raised more questions than it answered. It was hard to understand why such an insignificant incident needed to be reported to the speaker of the Duma at a time when apartment buildings were being blown up, with hundreds of deaths. And even if Seleznev had been referring to a minor criminal conflict in Volgodonsk, how was it possible that he had been informed about it two days in advance? A new source of accusations against Putin and the FSB emerged in London. Berezovsky, who had been instrumental in facilitating Putin’s rise to power but then had gone into exile after being deprived of his influence, held a press conference on March 5, 2002, in which he accused the FSB of carrying out the bombings with Putin’s complicity in order to justify a second Chechen war. The apartment bombings took place while Putin was prime minister and the head of the FSB was Nikolai Patrushev, his longtime protégé. But the planning for such a complex operation would have had to begin much earlier, before Putin became prime minister, at a time when Berezovsky was one of the most powerful members of the leadership. Berezovsky played a critical role in Putin’s ascent, making the case to members of the Yeltsin entourage that Putin should become prime minister. Berezovsky’s attitude toward Putin changed only when Putin acted to remove him from power. Berezovsky began to hint and then, in December 2001, to state openly that the apartment bombings had been carried out by the FSB, with the complicity of Putin. The independent commission began its work in February 2002 and achieved one important success. Yushenkov and Duma deputy Yuli Rybakov flew to London to attend the March 5 press conference organized by Berezovsky. Yushenkov met fugitive former FSB agent Alexander Litvinenko, who introduced Yushenkov to Mikhail Trepashkin, a former FSB agent and orthodox Communist who had been fired by the FSB after investigating the links between FSB officers and Chechen organized crime. After this meeting, Trepashkin began cooperating with the public commission. In April 2002, Yushenkov traveled to the U.S., where he met Aliona and Tanya Morozov, whose mother had been killed in the 1999 explosion in Moscow’s Guryanova Street. The Morozov sisters were officially crime victims, which meant they could present evidence in court proceedings. Tanya Morozova agreed to give Trepashkin her power of attorney, allowing him to submit evidence on her behalf. The person who rented the basement on Guryanova Street where the bomb had been placed had been using the passport of Mukhid Laipanov, a resident of the Karachaevo-Cherkesiya republic in the North Caucasus. The real Laipanov, however, had been killed in an auto accident in February 1999, seven months before the bombing took place. The police said that his passport had been used by Achemez Gochiyaev, an ethnic Karachai and the director of a Moscow construction firm. In the immediate aftermath of the Guryanova Street bombing, the police interviewed Mark Blumenfeld, the building superintendent. His description of the person who had rented the basement apartment was used to create a police sketch of a suspect. The sketch, however, was then quickly replaced with one of Gochiyaev, who looked completely different. When Gochiyaev learned that he was being accused of blowing up a building, he went into hiding. At the end of March 2002, Yuri Felshtinsky, a historian and an associate of Litvinenko, received a call from someone who said he was acting on behalf of Gochiyaev. At the end of April, an intermediary turned over a handwritten statement from Gochiyaev in which he said that he had been set up and had fled only because he knew that the FSB was getting ready to kill him. Trepashkin found Gochiyaev’s testimony convincing and decided to concentrate on locating the sketch of the original suspect. On the night of April 17, 2003, I was working in my Moscow apartment when I received a call telling me that Sergei Yushenkov had been shot dead in front of the entrance to his apartment building. My book Darkness at Dawn, in which I argued that the FSB was responsible for the apartment bombings, was due out in the U.S. in May, and now Sergei, who held the same view, had been murdered. Sergei was an active member of the public commission and had been full of enthusiasm when a few months earlier he had told me of plans to expose the real story of the bombings. I got up and went to the window and looked at the surrounding buildings, the street lamps, and the all-but-empty street. What horror is going on in this country? I wondered. For the first time in the 27 years I had been writing about Russia, I felt afraid even to leave my apartment. Yuri Shchekochikhin, another member of the public commission, died three months later. He was the victim of a mysterious illness that caused his skin to peel off and his internal organs to collapse. The Russian authorities refused to allow an autopsy, but his relatives managed to send tissue samples to London; based on these samples, he was tentatively found to have died from thallium poisoning. Thallium is the substance also believed to have been used in the poisoning of Roman Tsepov, Putin’s former bodyguard, in September 2004. With the deaths of Yushenkov and Shchekochikhin, Trepashkin was the only person left actively investigating the apartment bombings. As the lawyer for Tanya Morozova, he was entitled to review the FSB file, and he began to search for the original sketch of the suspect. He went through the file carefully but could not find any picture, suggesting it had been removed from the file. Acting on a hunch, Trepashkin began going through old newspaper archives in the hope that the original sketch had been published somewhere before the FSB had pulled it from circulation. After an exhaustive search, he finally found it. To his surprise, it was a sketch of someone he knew: Vladimir Romanovich, an FSB agent who in the mid 1990s had been responsible for investigating Chechen criminal organizations. Trepashkin next began to search for Blumenfeld, who was identified in the file as the person who had provided the description. He found Blumenfeld, who agreed to talk to him. Blumenfeld said that on the morning of the bombing he had described to the police the man who had rented the basement space, and that two days later he had been taken to Lefortovo prison, where FSB officers pressured him to change his story and “recognize” a photo of a different man, Gochiyaev. 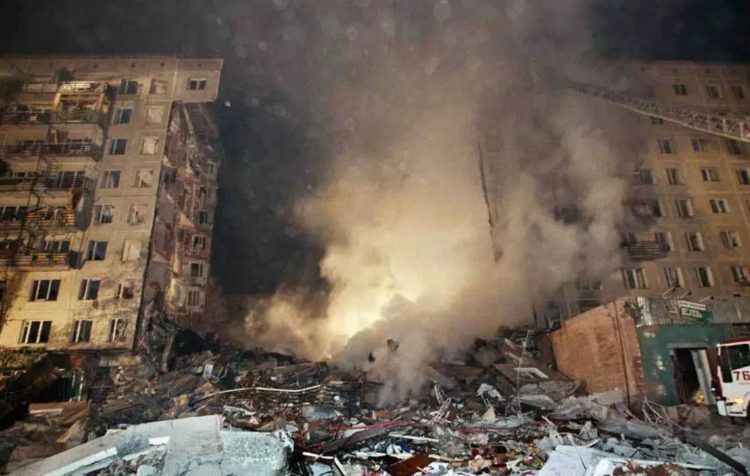 Trepashkin now was in a position to discredit the official explanation of the bombings, which Viktor Zakharov, the head of the Moscow FSB, had given in September 2000. Zakharov had said: “We know the entire chain. . . . The direct organizer of the terrorist acts was . . . Gochiyaev, known in Chechnya under the nickname ‘The Fox.’ He also led the perpetrators of the terrorist acts. All of them are adherents of the radical current of Wahhabism.” A trial was being prepared for Yusuf Krymshamkhalov and Adam Dekkushev, two members of what the authorities were calling the “band of Gochiyaev” who allegedly transported explosives to Volgodonsk. On the day after his meeting with Korolkov, Trepashkin was arrested and his apartment was searched. He was then accused of improper use of classified material and was sentenced to four years’ imprisonment in a labor camp in the Urals. As a result, his important testimony was never presented as evidence in court. With the arrest of Trepashkin, the investigation of the apartment bombings faltered. Those in Russia who wanted to raise the issue lacked investigative tools such as subpoena power and were well aware that too active an interest could cost them their lives. The rest of the world was complacent, unwilling to consider the implications of a terrorist’s being in charge of the world’s largest nuclear arsenal. In May 2003, Darkness at Dawn was published. A month later, I presented the book in Washington at the Hudson Institute, where I am a senior fellow. A German film crew arrived with Aliona Morozova. I explained why I believed that the apartment bombings were a provocation. My remarks provided the central narrative of a film titled “Disbelief,” which premiered in 2004 at the Sundance Film Festival. A Russian-language version of Disbelief was put on YouTube and circulated widely in Russia. But, unfortunately, real action required civic leaders — and persons capable of helping to make the bombings a serious political issue were disappearing one by one. Anna Politkovskaya, Russia’s leading investigative journalist, and Alexander Litvinenko continued to speak out on the case. Politkovskaya was shot dead in the elevator of her apartment block on October 7, 2006; Litvinenko died on November 23 from radioactive polonium-210 that had been put in his tea in a London sushi restaurant. The greatest barrier to accepting the evidence that points to the FSB as the perpetrator of the bombings is sheer reluctance to believe that such a thing could be possible. By any standard, murdering hundreds of innocent and randomly chosen fellow citizens in order to hold on to power is an example of cynicism that cannot be comprehended in a normal human context. But it is fully consistent with the Communist inheritance of Russia and with the kind of country that Russia has become. Russia never really forgot the apartment bombings. During the anti-Putin protests in 2011 and 2012, demonstrators carried signs referring to the attacks. It is common in Russia for people to avoid certain issues because otherwise “it will be impossible to live.” Unfortunately, an issue doesn’t disappear simply because it is ignored. Of all the dangers that hang over Russia, none is more menacing than the failure to demand answers to the 17-year-old mystery of how Putin came to power. – David Satter, a senior fellow at the Hudson Institute and a fellow at the Johns Hopkins University School of Advanced International Studies (SAIS), has been writing about Russia and the Soviet Union for four decades. This article is adapted from his new book, The Less You Know, the Better You Sleep: Russia’s Road to Terror and Dictatorship under Yeltsin and Putin, and originally appeared in the August 15, 2016 issue of National Review.